Dedicated to Horus, the falcon headed god, it was built during the reigns of six Ptolemies. We have a great deal of information about its construction from reliefs on outer areas. It was begun in 237 BC by Ptolemy III Euergetes I and was finished in 57 BC. Most of the work continued throughout this period with a brief interlude of 20 years while there was unrest during the period of Ptolemy IV and Ptolemy V Epiphanes. This is not only the best preserved ancient temple in Egypt, but the second largest after Karnak. 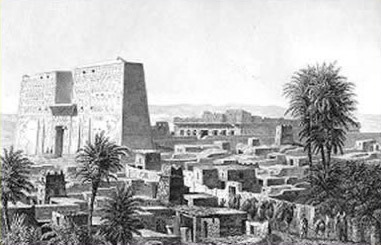 It was believed that the temple was built on the site of the great battle between Horus and Seth. Hence, the current temple was but the last in a long series of temples build on this location. It is said that the original structure housing a statue of Horus was a grass hut built in prehistoric times. 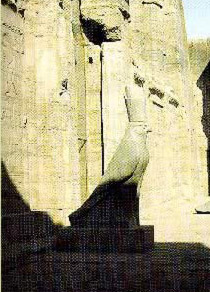 At any rate, there is an earlier and smaller pylon of Ramesses II which sits in a 90 degree angle to the current building. The main building, which includes a great Hypostyle Hall, was uncovered by Mariette in the 1860s. There are numerous reliefs, including a depiction of the Feast of the Beautiful Meeting, the annual reunion between Horus and his wife Hathor. The reliefs are mostly situated on the inside of the first pylon, and spiritually connect this temple with Hathors Temple at the Dendera complex. During the third month of summer, the priests at the Dendera complex would place the statue of Hathor on her barque (a ceremonial barge) and would thus bring the statue to the Edfu Temple, where it was believed that Horus and Hathor shared a conjugal visit. Each night, the god and goddess would retire to the mamissi, or berthing house. There is still an entrance colonnade to the mamissi, and reliefs with considerable remaining color just outside the main temple. These images portray the ritual of the birth of Harsomtus, son of Horus and Hathor. The pylons of the main Temple are about 118 feet high with typical scenes of the pharaoh in battle with his enemies. 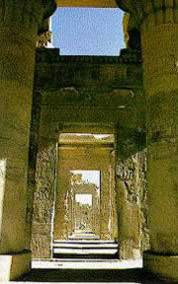 Within the pylons is the colonnaded courtyard with distinctive, pared columns, which leads into the great hypostyle hall. But on either side of the courtyard there are gates which lead to an area behind the temple and inside the bounding walls. Here, there are inscriptions recording donations of land which were probably transferred from demotic documents. There are also dramatic images depicting the defeat of Seth by Horus. There was an annual ritual called the known as the Triumph of Horus (10 harpoons) which ended in the slaying of a hippopotamus, the symbol of Seth. The facade of the first hypostyle hall has images honoring Horus and Hathor, and there is an immaculate ten foot tall colossi of Horus as the falcon god here (a matching colossi is was destroyed). As you enter the great hall, you will begin to notice the use of light Even though the temple was build over hundreds of years, it is very harmonious, and ebbs and flow of lighting was certainly purposeful, portraying a feeling of mystery. Just inside the hall are two small rooms, a robing room on the west and a library to the east where the priest would obtain the religious orders of the day. Within this hall are scenes of offering including the temple foundation ceremonies. Beyond the great hypostyle hall is a second, smaller hypostyle hall which leads to a well called the Chamber of the Nile where the Priests obtained pure holy water. This is a similar arrangement as found at Dendera. On the west side of the room are doors that lead to a small laboratory with recipes engraved on the walls for ointments and perfumes which where used daily to anoint the statue of Horus, and to a treasure room where offerings were stored. Beyond the second hypostyle hall is the offering hall, followed by the vestibule and finally the sanctuary. There is a granite naos here dedicated by Nectanebo II, making it the oldest relic in the temple. It is probable that a golden gilded wooden statue of Horus about 60 cm tall would have resided on the naos. This statue would have been cared for by the priests in a human manner, being washed, dressed, anointed, fed and entertained. The sanctuary itself is surrounded by chapels and rooms which, when facing north and in clockwise order, are the chapel of Min, the chamber of linen where the robs of the Horus would have been stored, the chamber of the throne of gods, the chamber of Osiris, the chamber of the West, the tomb of Osiris, the chamber of the victor (Horus), where there is a reconstructed ceremonial barge (barque), chapels of Khonsu and Hathor, the chapel of the throne of Re and a chapel of the spread wings, dedicated principally to Mehit, the lioness who guarded the path the soul passed on its journey towards resurrection. 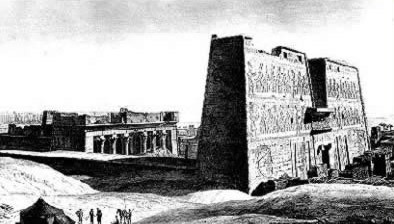 The front chapel on the east is the Chapel of the New Year, a sun court like that at Dendera. Here, a depiction on the ceiling show the voyage of the solar barque through the Twelve Hours of the day, with an inspiring image of the goddess, Nut. The statue of Horus would be taken from here up a flight of stairs to the roof terrace where it would be recharged by the sun during the Festival of the New Year. The walls of the stairs located in the outer anti-chamber depict this ritual.